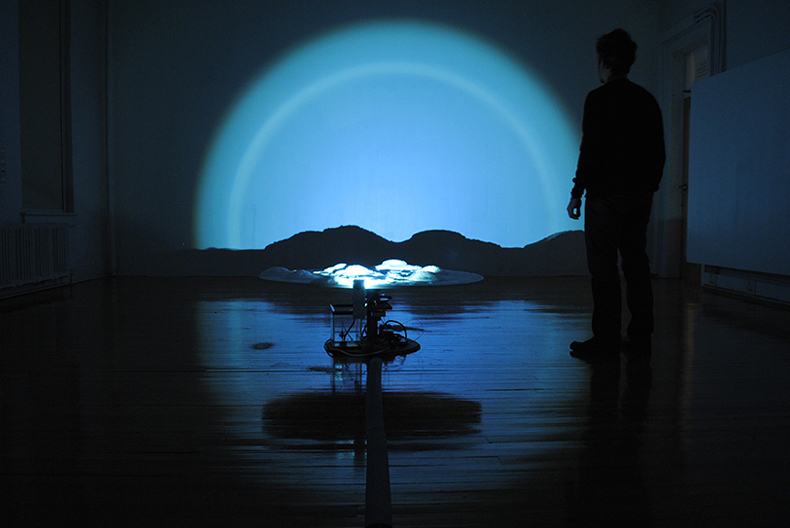 90° South is an installation that recreates the experience of a constantly changing environment with an unpredictable emergent topography. The contemplative and immersive nature of the installation allows the viewer to witness the constantevolution of growing landscape. Like some proto-cinematic technologies, such as the Panorama and the Magic Lantern, 90° South blends together both machine and nature. The immersive architectural space and the framing miniature effect of the growing landscape become an opportunity for an intimate contact with a fabricated nature. And so, the millennial temporality of different geological processes is transformed into a perceptible scale allowing the imagination to experience a phenomenon beyond reach: a space of wonderment, curiosity, and instability. 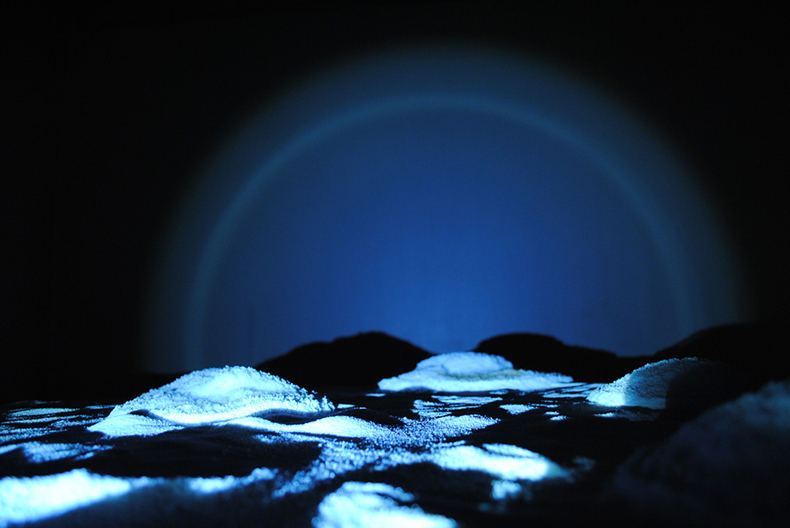 The work utilizes an irrigation system in conjunction with a highly absorbent material (sodium polyacrylate) that change its shape and structure when is in contact with water. A thin layer of polycrylate is placed on a rounded surface. When water reaches the surface, the sodium polyacrylate expands 300 times, changing its shape and producing subtle undulations. 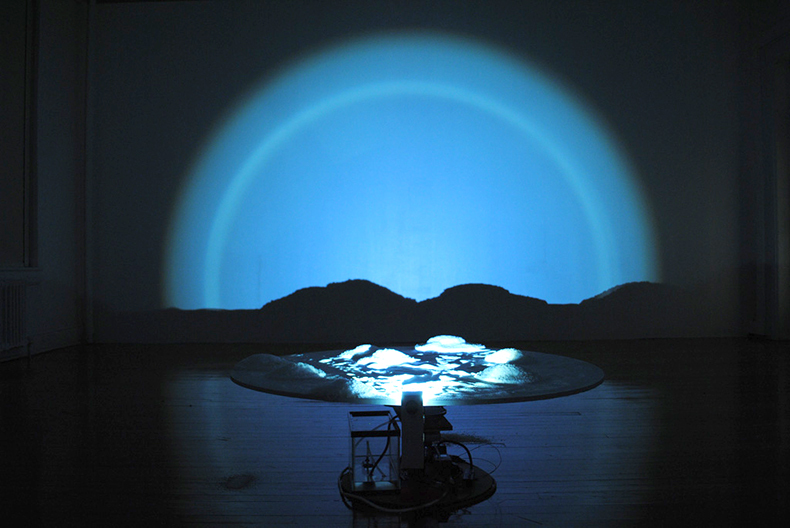 The silhouettes of these miniature mountains and hills are casted by a light attached to a rotating mechanism and projected on the walls of the gallery. As time passes and the material continues to expand, the profile of the landscape becomes more prominent giving the illusion of a vast terrain. The circular motion of the light casts the shadows of a simulated horizon suggesting the idea of a sun that never sets.